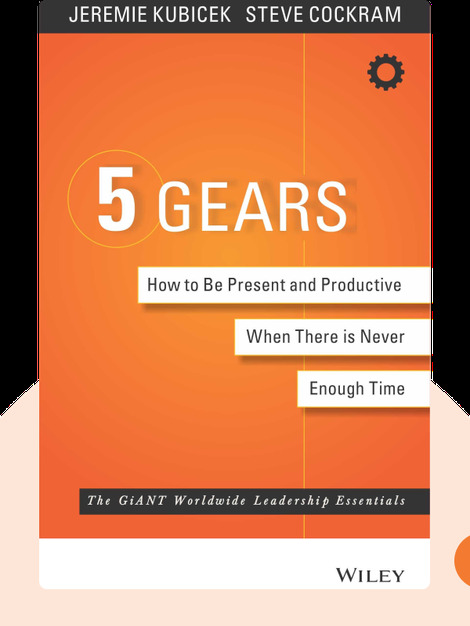 5 Gears (2015) focuses on adapting your attitude to your environment, whether that’s a physical space or just the time of day, in order to stabilize your work/life balance and get the most out of your relationships both at work and at home. While most techniques aim to fix this through time management, by understanding the principle and application of each gear, you’ll find it easier to apply yourself to each part of your day and get the best from every moment. Jeremie Kubicek and Steve Cockram are the co-founders of GiANT Worldwide. Kubicek lectures on leadership and personal growth and is the best-selling author of Making Your Leadership Come Alive. Cockram is a recognized expert on personality development and applied leadership learning. He also speaks and teaches globally. 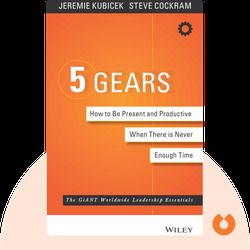 © Jeremie Kubicek & Steve Cockram: 5 Gears copyright 2015, John Wiley & Sons Inc. Used by permission of John Wiley & Sons Inc. and shall not be made available to any unauthorized third parties.